Two were arrested at the Super 8 hotel on National Road. 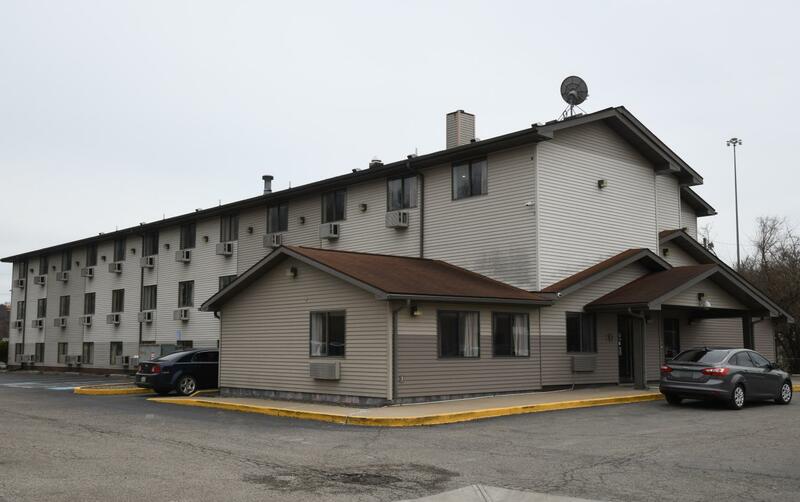 The person arrested Tuesday afternoon at the Super 8 hotel on National Road was one of eight suspects taken into custody in relation to a shooting Monday evening in Zanesville. Throughout the day Tuesday, the Zanesville Police Department, the department’s special response team, as well as the Muskingum County Sheriff’s Office special response team took people from various locations into custody in relation to the shooting. Two people were arrested at the Super 8 hotel, the other six were apprehended elsewhere, Captain Comstock of ZPD said. Multiple firearms were recovered throughout the day as authorities made the arrests. It’s possible that some of the eight people arrested will not be charged, but Comstock said charges are pending and will be presented later this afternoon. The shooting Monday occurred before 9 p.m. at 523 Schaum Ave. Personnel from the Zanesville Police Department were executing a search warrant at the home throughout the day Tuesday. The victim of the shooting sustained what are likely non-life-threatening injuries, Zanesville Public Safety Director Keane Toney said. No names or the circumstances surrounding the shooting have been released at this time as the case is still under investigation. Those taken into custody in relation to the shooting are being housed in both the Muskingum County and Zanesville City jails.